Do certification exams give business benefit? Increasing numbers of technology vendors run certification programmes to help customers, employees and partners demonstrate competence in using or advising on the vendor’s technology. This is common in IT, in medical equipment, in the automotive industry and in many other high-tech industries. Vendors who set up certification programmes gain by being able to define the skill sets and knowledge that people deploying their technology need and encouraging stakeholders to develop the knowledge and skills and so deploy the technology more successfully for customers. Participants benefit from certification as a way to learn and develop skills and demonstrate their competence, and it often helps in their career path. Customers and users of the technology benefit from more effective deployment by being able to ensure the skills of experts deploying the technology and being more likely to get a successful implementation. Employers of test-takers gain from their employees being more capable. But how real is the benefit? How can you know if a well-designed and well-implemented certification programme will lead to improved performance? There is some powerful evidence about this from an IDC study a few years back as reported on by Network World. 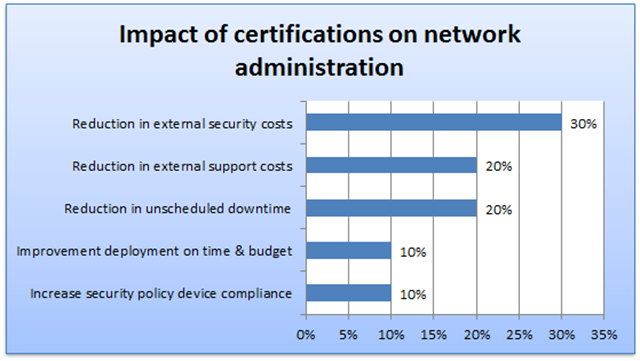 This study looked at the benefit of certifications within IT network administration – surveying more than 1,000 IT managers. You can see some of the results in the chart below. For instance on average, unscheduled network downtime was about 20% lower at organizations with more certified IT staff. This study related to one particular field of IT, but it seems likely that in any technical field, providing you follow good practice in developing your certification programme, similar results should apply. Therefore certification is likely to provide material business benefits. Questionmark is certainly seeing a lot of interest from customers looking to deliver certifications online, and I’ll talk about that in a follow-up post.